Go for it eat the ice cream ! Plus 1/4 in 4 days is NOT bad ! How very relaxing it must have been to have a massage. Did it make the baby move more ?? I feel like I’ve gotten out of control with the sweets and I CANT STOP!!! Sadly I feel like its been my whole pregnancy not just recently. I need to really clean up my diet and not be so glutenous! I have been anticipating when my breasts will leak. The massage sounds amazing. I’m gonna do that really soon. You look so so good lady! You definitely look like a pregnant goddess! 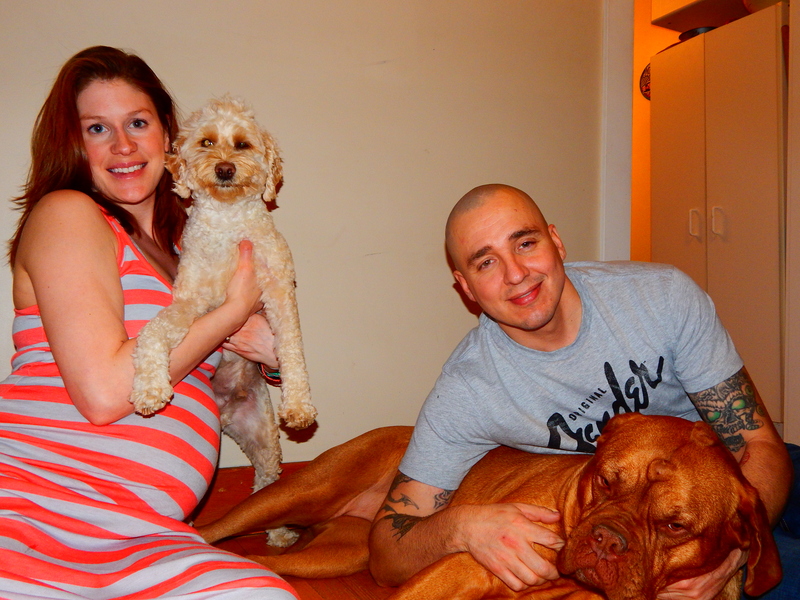 Your pups (and hubby) are super cute! OMG pregnant goddess?! you just made my day! You guys are too cute! For the record, I think I ate a 1/4 ice cream cake myself for my birthday. And I’m not even sorry. ice cream cake is just so delicious! u look gorgeous. Go for the ice cream – u deserve it!! There is a connection between pregnancy and ice cream that needs to be studied! I had tons of sweet cravings, especially for ice cream, looking back I ate WAY too much. I’d probably eat what you did in a day back then! By the way you look wonderful! 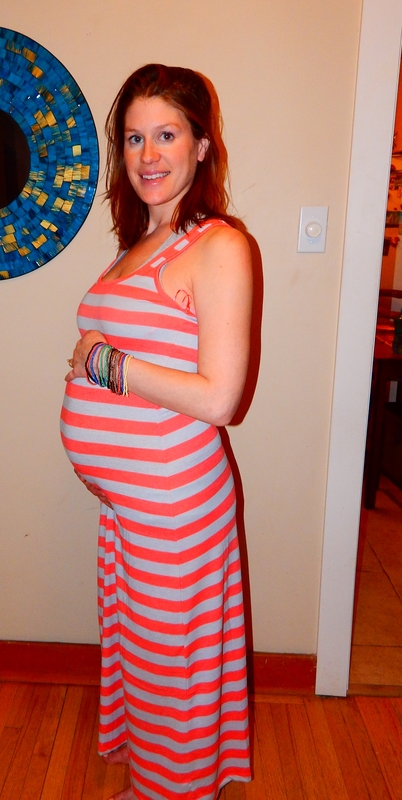 I love horizontal stripes on pregnant ladies, it shows off the curves more. I always wondered if a prenatal massage would be relaxing or a bit uncomfortable, now I know. There totally is a connection between ice cream and pregnancy… I never craved ice cream before and now I am craving it all the time. you look beautiful! lots of calcium in ice cream LOL! I love that dress! You look so beautiful! Yay to getting pampered… Leaking is weird huh? You must have been very relaxed! For me it didn’t happen until Yu was here and I was a couple of weeks in with the pumping / breastfeeding, but now I have to wear breastpads. Hoping the last stretch will go smoothly! You look great! And I am very impressed with your restraint with the ice cream. I’d have that container gone in a night. You’re getting so close!!! Yeah just a slice (or two) of ice cream cake a day. When it’s gone I am going to try not to buy more! I really am getting close – so crazy! Here I thought you were going to say you ate the whole cake in one sitting. 1/4 in 4 days is child’s play! lol You are so cute. I’m glad you have been healthy most of the time, and like you said before….as long as you’re getting in the veggies too, you’re golden. Enjoy living it up! You look adorable! haha can you imagine eating the whole cake in one sitting? I’ve been limiting myself to a slice or two a day. Looking lovely! Definitely have a pregnancy glow.